Chandravarna and his four wives were spending their time in all pleasure. After some time, Chandravarna was blessed with four sons, one each to his wives. Brahmin wife gave birth to Pallava, Kshatriya wife to Vikramaditya, Vaisya wife to Bhatti and Alankaaravalli gave birth to Bharthruhari. All the four sons of Chandravarna grew intelligent and stronger day after day. By the time they became adolescent they learnt all the possible sciences and war arts. As the time was passing by like this peacefully, Prathishta Puram King suffered a major health break. Realising that he cannot live long, he decided to make Chandravarna as King after him. This was due as he had no sons to succeed him. People of the kingdom rejoiced on Chandravarna's appointment as their King, for he was a well-learnt and disciplined man. Chandravarna met the expectations of the people through his administration and political policies. His fame and reputation spread in the neighbouring kingdoms too. Years passed this way in all comfort to Prathishta Puram King and his people. The learned Chandravarna knowing that his departure time was fast approaching summoned all the four sons to his presence. My dear sons! Listen carefully. Alankaaravalli becomes my eldest wife and first queen. She was the reason behind marrying your mothers, all the three. Her son Bharthruhari takes over the throne after me. I will make him my successor and rest three will become princes and help the elder one in his rule Chandravarna continued, in all the matters you three should support him for a better administration of the kingdom and ruling people righteously. The sons collectively promised Chandravarna, We all abide by your words, Father! This appeased Chandravarna. One fine day Bharthruhari was made King for Prathishta Puram. Blessing him to rule the country in a progressive manner, Chandravarna died. Bharthruhari, after the death of Chandravarna ruled the kingdom in favour of the people. 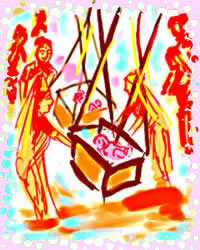 People treated the four on par to the great brothers Rama, Lakshmana, Bharatha and Sathrughna of Ramayana. Treating everyone equal before the Law, Bharthruhari with the help of his three younger brothers gathered reputation as good as his father. After some years, Pallava --born to the Brahmin queen-- took his road to the forests desiring to achieve salvation. Shortly after Pallava left, King Bharthruhari vexed with his wife's illicit behaviour throned Vikramaditya as King and Bhatti as chief of the ministers council and left to forest for meditation. Hence, was the sequence how Vikramaditya became King of Prathishta Puram and Bhatti his chief minister. With the passage of time, Vikramaditya with the assistance of Bhatti spread his kingdom. They constructed a new township named Ujjain. Making Ujjain as his capital, Vikramaditya was ruling the expanded kingdom. How and Where Did Bhethala Come From? Long time ago, (perhaps long before Vikramaditya was born) Lord Shiva and Goddess Parvathi were all alone in a temple. At that time, Parvathi after salutations to Lord Shiva requested My Dear Lord! Please tell me some puzzle stories that were never heard by any one in this world. Dear Lady! Lord Shiva said, Listen. I will tell you some strange stories according to your wish. These plots are not known to any one in this world. Then, he continued telling her many stories. Exactly at the time Lord Shiva was narrating the strange stories to Goddess Parvathi, a Brahmin who came to the temple for offerings hid nearby and listened all the narrations of Lord Shiva. Once Lord Shiva completed his stories, the hiding Brahmin ran to his house and recited them to his wife. In turn, Brahmin's wife spread the stories to the neighbouring ladies and they went so on spreading all over. Goddess Parvathi came to know of these stories popular on earth. She immediately rushed to Lord Shiva and angrily told him, My Lord! You promised me to tell tales unknown to others and narrated me all the tales that are widely popular on the earth. This is not fair on your part to lie to me. Lord Shiva in a wink knew about the Brahmin and his actions. Lord Shiva made the Brahmin appear before him and cursed him You cheat! Why did you spread the stories that I confidentially narrated to Goddess Parvathi? You will turn into a ghost. The poor Brahmin on hearing the curse shivered and pleaded for pardon from Lord Shiva. Hey Lord Parama Shiva Shankara! Kindly excuse my mistake. Please tell me how can I emerge out of your curse. By that time, Lord Shiva was little cool. After sometime, a King takes birth on earth by name Vikramaditya. Ruling his kingdom, he comes to you following a request of a saint. You narrate him all the stories you knew hiding in the temple. You will go free from the curse, as soon as you finish them Lord told him. Brahmin with no other go, satisfied with the reclamation from Lord Shiva, turned into a ghost and started living on a dense tree in a forest.